Dover Hall and Michael David Winery have created a delicious 5-course wine dinner that will be hosted by wine maker, Michael Phillips at Dover Hall. Chef Lee Hendrickson and our Sommelier, Chad Hornik have hand-selected each of the food items to compliment each of the preselected Michael David wines. You won't want to miss this amazing event! Reserve your seats today. "Michael" and "David" are Michael and David Phillips, brothers whose family has farmed fruit and vegetables in the Lodi region since the 1850s, cultivating wine grapes for nearly a century. Michael and David constitute the 5th generation of grape growers in the Philips family, with the 6th generation now an integral part of the family business. The Phillips family has called Lodi their home for 6 generations, and their winery, still family-run, continues to stay committed to the land, community, and spirit of our hometown. Their unconventional collection of wines are all responsibly grown in Lodi, California according to the Lodi Rules, a set of over 100 standards that account for all aspects of making quality wine in a sustainable manner: environmental, social, and economic. 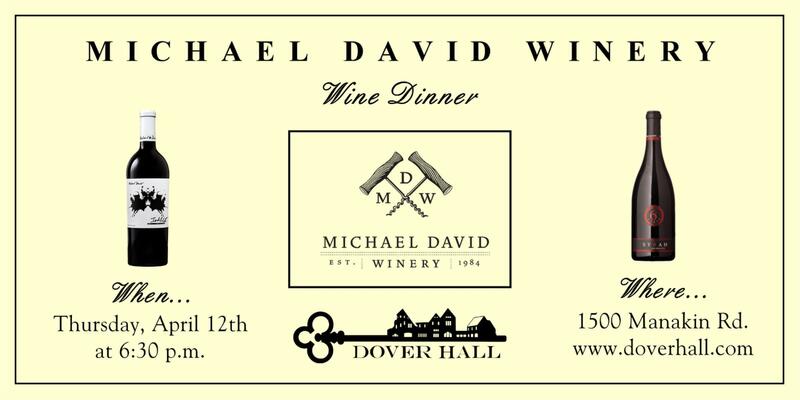 *** As with all Dover Hall wine dinner events, you will have the opportunity to purchase each of the Michael David wines to stock your wine cellar at home.